You've likely seen it before: an old, dilapidated boat in the slip a little ways down the dock, ugly coloration and pocks of corrosion eating away at its hull and underwater drive systems. Surely a sad sight for any boat lover to witness. But what exactly is this "invisible" force chewing at the steel below the water level? Electrolysis occurs any time you pass an electric current through water, and when two dissimilar metals are immersed in this water. The electric current can come from anything from faulty wiring in your own or your neighbor's boat or an electrical box on the dock that isn't fully insulated. The danger may not be enough to harm anyone who gets into the water, but the electrolysis doesn't need much power behind the current to do its damage. Dissimilar metals, when placed in water, have different electrolysis voltages. So if they are connected, an electrical current flows through the entire boat, like a battery in some ways. As the current leaves one metal to travel to the other, it causes metal to erode from one surface and be deposited on the other. Electrolysis can also occur when an adjacent structure or boat is injecting DC current into the water. That current goes in one end of your boat and out the other on its way to the destination. 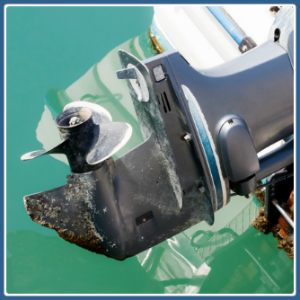 This can cause electrolysis as well, even though your boat is not at fault. There are a few basic ways to reduce electrolysis. The best way of course would be to install an Armored Hull Boat Shield™. That will help eliminate nearly 99% of your electrolysis problems. Another one is to completely disconnect the electrical circuit. 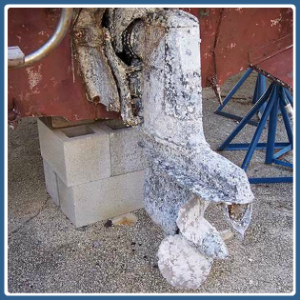 If this isn't an option, whether because you don't have easy access to it or you cannot afford to make the repairs right now, another method is to provide sacrificial anodes, made of zinc, which deteriorate rather than your expensive boat. We'll come back to the anode solution in a bit. Electrolysis cannot occur on a lone piece of metal in water, because if it is isolated, no current can flow, meaning there is no electrolysis. However, when your first piece of metal is connected to a differing type of metal, you just created a virtual battery and electrolysis will begin. In short, if your boat was constructed by bonding everything in the boat, the craft is essentially a battery, and electrolysis becomes a major problem. To avoid this problem, only bond underwater items that are already showing symptoms of electrolysis. If there's not an issue there, don't create one. Once you bond your boat's hull unnecessarily you have inadvetantly created a circuit rather than stopping one, and you must start with the anode solution, since you have removed the first line of protection. Although some thru-hull designs appear to be immune from electrolysis, due to sitting in fiberglass and using non-metallic tubing, they quite often are not and do make use of bonding. For example, the raw water cooling inlet for an inboard engine is in fact connected to the engine block by the salt water in the tubing and may need bonding so the current flows though copper rather than through the water and through hull. As we've discussed, whenever different metals are placed in a conductive liquid you create a battery. If you connect these pieces of metal together, current will flow. And the process of the current removing metal from one of the metal pieces is electrolysis. If this piece is the zinc in your flashlight battery, that is good, but if it's one of the parts to your propeller, it is clearly bad. 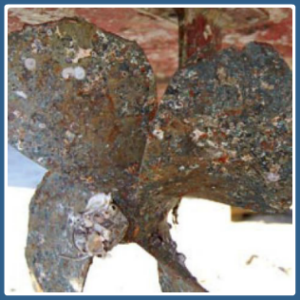 The zincs you use on a boat are called sacrificial anodes. 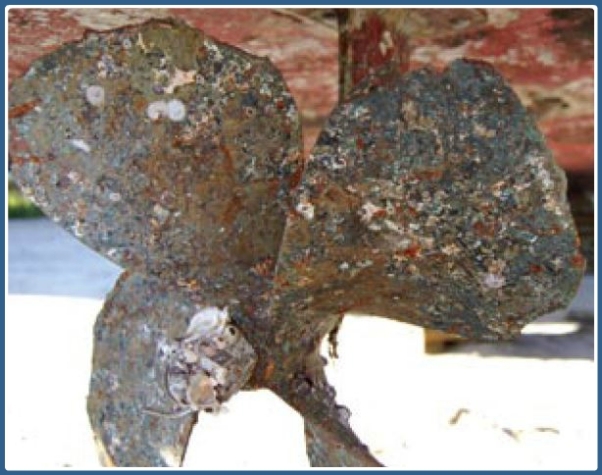 Zinc is the sacrificial metal of choice because it has a higher voltage when in the water, so the current will be more inclined to flow from it than from your propeller. To complete the electrical circuit, the zincs must be connected to the items they are intended to protect. Usually this is no problem, because the zinc is installed right to the shaft or underwater housing. Non-metal boats will usually have a copper bonding wire inside that connects all the underwater metal items together, so they all share the protection from zinc anodes. Since engines use the metal frame as the negative battery connection and the engine is connected to the prop shaft, the engine and the negative side of your 12-volt system are also part of this bonding connection. This bonding wire is usually connected somewhere to the rigging. This is not to prevent electrolysis, but rather gives some protection from lightning strikes, as it will conduct the energy from lightning into the water, passing through the connected items. If other currents are allowed to get into this bonding circuit, they can easily overpower the small voltage available from your zincs and defeat the protection you need. This is usually the most destructive form of electrolysis, and you will notice it because your zincs get eaten up very quickly while trying in vain to keep up. Under normal circumstances, zincs should last at least a year if they are working normally and much longer if you don't have any problems. If they are being completely consumed in a shorter period of time, you need to find where the external current is getting in. The most common source of this external current is the aforementioned shore power connection, especially the ground lead. Docks can be sloppy with their wiring, and often the ground lead is not connected to ground, or is connected to the neutral, being used for carrying current to a mis-wired boat and all other sorts of problems. The ground lead should never be directly connected to the ground bonding system discussed earlier. The purpose of the shore power ground lead is to provide a return path for a current if there is a short circuit or power leakage from an appliance or the wiring on the boat. You don't want it to connect all the underwater items on your boat to the underwater items on all the other boats and the dock, as well, because now your zinc is trying to absorb the charge everywhere and protect everyone else, too. Unfortunately it is not always possible to keep the circuits separate due to interconnections, such as shore power chargers. There are a number of ways to separate the shore power ground from the boat's underwater bonding system, but the generally agreed-upon best and safest way is to use a galvanic isolator to introduce a 1.2-volt insulator in the circuit. This is enough to isolate most galvanic voltages, but it will still conduct electrical faults and keep the boat safe in the event of a ground fault in the wiring or in an appliance. The galvanic isolator must be rated for the size of your shore power circuit. In situations where you need a large amount of zinc power for a relatively short period of time, consider using a zinc fish. These are large lumps of zinc, often cast in the shape of a fish, that are cheaper and easier to replace than the zincs on your shaft. These "fish" come with a copper wire already attached, which is then used to hang them in the water. They have an alligator clip on the end of the wire, which is connected to the negative bonding circuit on your boat. If it is not conveniently available in the cockpit in the vicinity of the prop, you might consider installing a stainless bolt for clipping it to, with the head of the bolt inside the deck connected to the negative bonding system. Clipping it to the shrouds or railing will only work if somewhere on the boat the shrouds are connected to this boat negative bonding system. With an Armored Hull Boat Shield™ you can not only eliminate most, if not all of the potential damage caused by electrolysis, you will also be eliminating the cost of constantly having to pay a diver to replace your zincs.